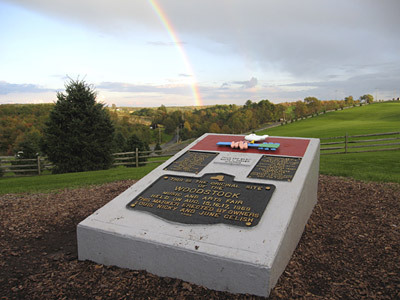 "My wife has always wanted to see where the Woodstock Festival was held," said Jim Stocking. "The two of us, along with my brother and his wife and daughter, made a pilgrimage out there on a day that began as rainy and overcast. By the time we got there, however, the sun was breaking through and we saw a beautiful rainbow." "I took the picture with my Canon S80 using program mode with white balance set to cloudy, then I checked the histogram to make sure the exposure did not clip at either end. I used the Curves adjustment in Photoshop to tweak up the image, trying to darken the rainbow and lighten the landscape." Beautiful photo of a very memorable location ..